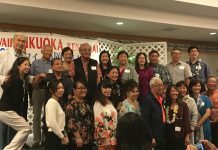 The Japan-America Society of Hawaii celebrated the arrival of the new year with a reception at Washington Place on Jan. 28. Guests received individual Shinto blessings as well as a good luck amulet by Bishop Daiya Amano and Rev. Jun Miyasaka of the Izumo Taishakyo Mission of Hawaii. Ryukyukoku Matsuri Daiko performed a shishimai and taiko performance. Opening remarks were given by JASH’s newly elected chairman Sal Miwa and a blessing was offered by Bishop Eric Matsumoto of the Honpa Hongwanji Mission of Hawaii. Also delivering remarks were JASH director Stanford Carr and Gov. David Ige. The reception featured a kagamiwari (breaking open of the sake barrel) ceremony by Gov. Ige, Honolulu Mayor Kirk Caldwell, Consul General Yasushi Misawa, JASH chairman Sal Miwa and JASH director Stanford Carr. Consul General Misawa offered the kampai toast. 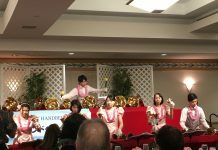 Prior to his toast, Misawa made reference to Setsubun or “division of seasons,” since the JASH celebration was took place later in the month. Setsubun marks the end of winter and occurs around Feb. 3. On that day, in a custom called mame-maki, people throw and scatter soy beans inside and outside of their homes while saying, “Get goblins out of the house! Invite happiness into the home!” Some people even put on oni (ogre) masks while performing this custom. To illustrate his point, Misawa held up two oni dolls made by his wife, Yoko. A red ogre (Aka Oni) and a blue ogre (Ao Oni). 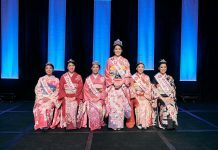 The event was sponsored by Stanford Carr and Stanford Carr Development LLC and featured dishes from the Mariposa restaurant at Neiman Marcus with beverages from the Kokusai Sake Kai and The Cherry Company.